Visitation services for Rosa Lee Sutton, 78, West Plains, Missouri, will be held from 6:00 until 8:00 p.m., Friday, November 30, 2018 at Robertson-Drago Funeral Home. 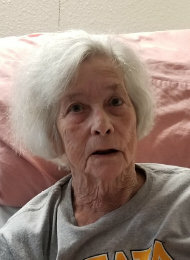 Mrs. Sutton passed away at 7:25 a.m., Wednesday, November 28, 2018 at West Vue Nursing Center. She was born March 6, 1940, at West Plains, Missouri, to Leo Philpott and Rosa Pearl Garver. In June, 1982, she was married at West Plains, to Norris Sutton. Rosa loved her family and enjoyed raising her kids. She loved flowers, working in her flower gardens, cooking, crocheting and most recently she enjoyed Nintendo games, watching game shows and puzzle books. She is survived by her husband, Norris Sutton; seven children, Charlotte Schroeder and special friend, Edward Namanny, Atlantic, Iowa, Charlene Johnson and husband, Eric, St. Louis, Missouri, Angie Kirchner, Atlantic, Iowa, Audrey Johnson and husband, Allen, Sidney, Iowa, Nona Erickson and husband, Terry, Lewis, Iowa, Mona Mattes, West Plains and Kevin Sutton, West Plains; twenty-one grandchildren; many great-grandchildren; several great-great-grandchildren; one brother, Jim Philpott, Norfork, Arkansas; one sister, Ardena Moerschel and husband, Ernest, Brandsville, Missouri; and several nieces and nephews. Her parents, three sons, Robert Philpott, Rick Philpott and Gus Franklin and one infant son, Keith Sutton, preceded her in death. A private burial will be held at a later date at Blue Mound Cemetery. I’m sorry to hear of Rosa Lee passing. I remember her from my childhood her and my mother “Catherine Pilkinton-Roberts” were good friends. My thoughts and prayers are with each of you as you go through difficult time. Im so sorry for your loss. Thinking of everyone.